Aluminum signs, also known as metal art signs, are widely used because of their durability in all weather, their light weight, and their great longevity. Wear and tear are minimal, and print and colors remain visible on boards for years. Hence, they are an extremely cost-effective choice for sign boards. If you wish your sign boards to carry your brand, there is nothing better than choosing strong and flexible aluminum signs. 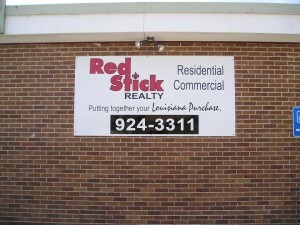 Greater Baton Rouge Signs provides a wide range of aluminum signs to suit your requirements and budget. Aluminum signs are very popular among the corporate houses, hotels, and restaurants, and, of course, traffic departments, who use reflective aluminum signs on roads. Reflective aluminum signs greatly assist drivers at night. Corporate Brand Name: Displays your company’s name, logo, and address on a wall, in a lobby, in the front area of a factory, or anywhere else, making it clearly visible for visitors. Signage: This will guide new visitors to your official premises if your commercial parking is located some distance from the entrance of your building. It also can be helpful to show directions to a reception area, a pantry, parking facilities, and more. Directions: Small or medium-sized signs can be used to guide visitors. The sign may include building numbers, names of departments, instructions, warnings, etc. Advertising: Small aluminum signs can be useful for advertising different products in various places. We can make these aluminum signs in different sizes, thicknesses, various color combinations, and fonts, per your requirements. We also can supply them in forms such as wall-mounted, standard posts, finger posts, and panels. You decide the artwork and we do the rest. 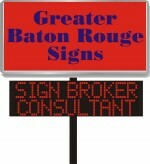 Greater Baton Rouge Signs possesses a huge database of types of designs, sizes and colors of aluminum signs, plus the capability to produce them on clients’ demand. We help our valuable customers by making choices easy and living up to their expectations.